Eleven years have passed since Maina Sunar was detained and subsequently murdered by the Army at a base in Panchkhal in Kavre. It was exactly 11 years ago today that an army patrol detained Maina, who was just 15-year-old, for interrogation. She was suspected to be a Maoist. It was later revealed that she was electrocuted to death on the same night. Initially, the army claimed she was killed in an encounter. But, under pressure from human rights activists, it set up a court of inquiry and concluded that she was indeed tortured and killed. Maina’s case became an iconic symbol of the human rights violations perpetrated by both sides in the decade-long conflict. 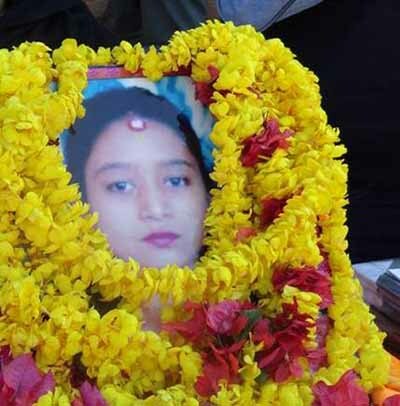 Maina’s mother, Devi Sunar, is still struggling to get justice ever since she lodged a complaint at the District Police Office in Dhulikhel against four army officers allegedly involved in Maina’s extra-judicial killing. But, they are yet to be punished by a civilian court, and some of them are still serving in the army. Devi, who now lives with her two sons in Kathmandu, has named army officers Babi Khatri, Niranjan Basnet, Amit Pun and Sunil Adhikari as the perpetrators of Maina’s murder. The army froze their promotion and detained them for some time but they are yet to be tried. Devi also expressed dissatisfaction over formation of Truth and Reconciliation Committee (TRC), saying that it was “a waste of money”. At the program, human rights activists also flayed the government for forming transitional justice mechanisms without amending the Act on Commission on Investigation of Disappeared Persons, Truth and Reconciliation-2014 that allows the TRC to grant amnesty for perpetrators of human rights violations. Conflict victims have mainly objected to two provisions of the act: the amnesty provision and the decision not to criminalise forced disappearances. Conflict victims have filed a writ petition at the Supreme Court (SC) against the controversial provisions of the act. The SC is scheduled to deliver it verdict on 26 February. “It’s puzzling why the government didn’t wait for the SC verdict,” he said. Members of the TRC were appointed on the basis of recommendations made by a committee that included a commissioner of the NHRC. The committee recommended people close to political parties as the TRC members, fueling speculations among conflict victims that it is just a ploy to grant amnesty to perpetrators of human rights violation. Peculiar nature of nepalese politics is ” Let it be”. Whoever comes in power or about to come in power initially shouts for this and that for citizens. Nepalese citizen who are very far from real politicians are compelled to believe them. “Maina sunuwar murder case” which was worst crime by army was a known case from very time. Lots of commitment were heard during various phases of time , even was used to gain vote by politicians. I may or may not represent youth of this nation but I have totally lost belief from these politicians. Literally I have been a mental patient by ever-changing words and behaviour of Nepalese politicians. No vision , no reason and no conclusion . Just let it be… Constitution- ” Let it be”, Unemployment- ” Let it be”, Injustice- ” Let it be”, No Gas – ” Let it be”, Foreign Influence – ” Let it be”, and a time comes ( Lets not hope) when a foreigner says, ‘no more Nepal’ – ” Let it be”. Rest in peace Maina Sunuwar , you will be remembered on your death anniversary. forgiveness is one part of the issue, true penance and renunciation of violence is another. let us talk about that as well.